Marilyn Vine brings you information on Gardasil Vaccine. This vaccine is used for the prevention of cervical cancer. When you start and read the articles below you really will start to question why all the scare mongering in relation to cervical cancer and the necessity to have Gardasil. Now in February 2019 I am reading that American health freedom is once again under attack with Florida and twenty-nine other States rolling out legislation which will coerce and/or mandate a large number of vaccines. It will also remove family’s privacy rights with regards to their vaccine status. See the link below on Mandatory HPV vaccine for school children in Florida. More Gardasil vaccine information contained at this link. GreenMedia on 21 February 2019 published this Gardasil vaccine article “URGENT: Mandatory HPV Jabs for School Kids in FL + 100 Vaccine Bills Flood 30 States”. Please click this link to see how rights have been compromised and to find a link where you can lodge a protest. 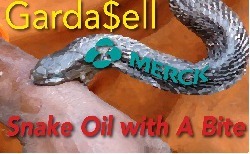 Has Merck been involved in deceit and negligence? “What are “sacrificial virgins,” you may be asking? “The push for increased use of the Gardasil vaccine in adolescent girls continues, despite even more evidence of severe HPV vaccine risks. Another teenage girl is telling her story about being rendered paralyzed by the HPV vaccine. Please read the article before having your child vaccinated with this particular vaccine. Please find the media release here: AND GUESS WHAT – IT HAS NOW DISAPPEARED! Dr. Harper explained in her presentation that the cervical cancer risk in the U.S. is already extremely low, and that vaccinations are unlikely to have any effect upon the rate of cervical cancer in the United States. In fact, 70% of all H.P.V. infections resolve themselves without treatment in a year, and the number rises to well over 90% in two years. Harper also mentioned the safety angle. All trials of the vaccines were done on children aged 15 and above, despite them currently being marketed for 9-year-olds. So far, 15,037 girls have reported adverse side effects from Gardasil alone to the Vaccine Adverse Event Reporting System (V.A.E.R.S. ), and this number only reflects parents who underwent the hurdles required for reporting adverse reactions. 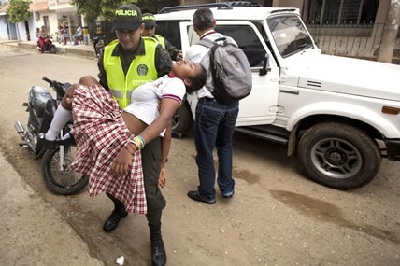 At the time of writing, 44 girls are officially known to have died from these vaccines. (how many more since 2013?). The reported side effects include Guillian Barré Syndrome (paralysis lasting for years, or permanently — sometimes eventually causing suffocation), lupus, seizures, blood clots, and brain inflammation. Parents are usually not made aware of these risks. Dr. Harper, the vaccine developer, claimed that she was speaking out, so that she might finally be able to sleep at night. 13-year-old in a wheelchair wanting to die! NaturalHealth 365 dated 5 June 2017 brings us this Gardasil vaccine story “HPV vaccine puts 13 year old in wheelchair with constant whole body pain, mother claims and doctors deny”. This is just one of many instances that I have read about children being paralysed or even dying from this vaccine. Click this link to read the NaturalHealth article on the Gardasil Vaccine. Published 26 June 2015: Learn how Merck uses live HPV virus mixed with aluminum then make your decision before using the Gardasil Vaccine! Bookmark this Gardasil page as I am sure in time there will be further information. “Teen girls and their mothers in Ireland are setting an example for how to build an influential movement to fight back against a mainstream vaccine consensus that pushes the dangerous human papillomavirus (HPV) vaccine on girls as young as eleven. Please click the link to read the article and see if you are able to support REGRET in any way or even start up a similar group in your own country. 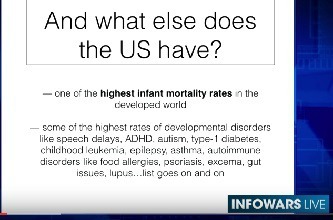 Brandy Vaughn founder of Council for Vaccine Safety speaks out about the mandatory vaccination schedule taking place in America. It is about time that a case like this should reach the courts. Most families do not have the means to take action and when their child is severely damaged not to be in the space to deal with another very stressful event. I wish this mother all the best in her endeavours and look forward to hearing news on the outcome. In the meantime click this link to read more. 11 November 2015 we learn that parents in Indiana were successful in helping to turn back efforts by their state’s health department to coerce and pressure parents, outside of law, into having their children receive the potentially dangerous human papillomavirus vaccine (HPV). Independent health journalist Jefferey Jaxen was contacted by two separate families telling of letters they received by their state’s health departments regarding their child’s HPV vaccine status. An article chronicling the incidents was immediately published to raise awareness on October 5th, 2015. Click this link to read the full Gardasil Vaccine article and in the article you will see the billions of dollars paid to recompense people for injuries caused. “It is a story that is becoming all-too-common: parents provide permission for their daughters to receive HPV vaccines, believing it to be the “right” thing to do to keep their children healthy. But instead, the previously healthy girls suffer a serious illness after receiving the immunization. At long last, even if it is only the United Kingdom, the media is actually telling the public what is really happening. “The Medicines and Healthcare Products Regulatory Agency announced that 8,228 young girls had suffered debilitating side effects from the HPV injection. However, the number is estimated to be only ten per cent of the true number of teens struck down with severe side effects after taking the vaccine.” Please click this link to read this full article. I believe it is important that you read this article before making any decisions with regards to using this vaccine on your child or yourself for that matter. I also believe that when other concerned members of the public start to try and stop governments from making vaccines mandatory that we should support them in their endeavors. Often these people are vilified by the media and public figures. Prevent Disease on 19 September 2014 advises of a mysterious illness being experienced when the girls receive HPV Vaccine. They report that girls are being debilitated all over the world and that the HPV vaccine is to blame. Please click this link to learn more. Information on Gardasil vaccine from around the world but not being heard in Australia! Is the Australian media unaware of this or just not wanting to share with the Australian people so that they can understand what is happening? I have been provided with this information and wish to share it with you. Over 200 medical professionals have now signed an open letter describing their concerns about the safety, efficacy and necessity for using HPV vaccines in national cervical cancer programs. Click this link to learn more. A public hearing in France has confirmed that vaccines containing aluminium adjuvant are the cause of vaccine-induced illnesses that are more common in genetically pre-disposed individuals. These illnesses would not occur without the vaccines. HPV vaccines have 3X as much aluminium adjuvant as other vaccines. Click this link to learn more. As of April 2014 the Japanese government will no longer be recommending HPV vaccines in government vaccination programs due to concerns about serious adverse events. India, Utah and France have also expressed their concerns. Again click this link. Research on the HPV vaccine has recently been presented at the Euroscicon Controlling Cancer Summit in London (12 May 2014). The paper I presented was titled 'HPV vaccines have not been demonstrated to be safe or effective in the prevention of cervical cancer'. All medical interventions are a matter of informed choice and this is particularly the case for preventative medical procedures that are recommended to healthy individuals in genetically-diverse communities. Here is a link to the NSW Health Directive on Informed Consent. GreenMedia on 12 May 2014 has provided information on HPV DNA being attached to Merck’s aluminum adjuvant. On reading the article it appears that the research done by Dr Lee has provided some disturbing results. It appears that Helen Petousis-Harris PhD, the Director of Immunisation Research and Vaccinology Immunisation Advisory Centre at The University of Auckland is doing to Dr Lee exactly what was done to Dr Andrew Wakefield by saying that “no one has replicated his findings.” In the end Dr Andrew Wakefield was exonerated. I believe that it is important to read the information provided in this article. NaturalNews on 15 August 2013 brings an article with regards to a lead Gardasil developer admitting that this vaccine is useless and this was back in 2009! Not only since this time have they started to vaccinate young boys but in the last two weeks I am reading that they are planning to start and vaccinate newborn babies! Post Mortem evidence of Gardasil Vaccine found in the brain! On 14 November 2012 NaturalNews brings information published in Pharmaceutical Regulatory Affairs about two different girls from different parts of the world showing evidence of viral components contained in the HPV vaccine Gardasil that are capable of crossing the blood-brain barrier and triggering cerebral vasculitis, a severe form of blood vessel inflammation in the brain that can lead to severe autoimmune disorders and even death. ARE YOU STILL THINKING OF GETTING YOUR SON OR DAUGHTER VACCINATED FOR A DISEASE THAT THEY MAY NEVER CONTRACT IN THE FIRST PLACE? My own personal belief and remember I am not a medical person, is that if you eat healthy, use safe non toxic products for your own personal hygiene and cleaning your house, keep your stress levels under control then you are going a long way to keeping your immune system up and running in a healthy condition. Given the right nutritional supplements to supplement healthy eating then the body has the ability to heal and maintain itself. Why risk ANY VACCINE which over-rides this system? Check out the following links to learn more about different ingredients, etc. this will give you a very good understanding. Many other pages on health alerting you to the pitfalls and dangers that surround you. Click on the link to read more about what is being uncovered. Does the vaccine developed to prevent cancer actually help to promote it? On 13 May 2012 information was received on Gardasil Vaccine from VacTruth organisation questioning whether in fact that certain people when given the vaccine actually then became cancerous. An excerpt from the article is contained here and it is recommended that the entire article be read by clicking on the link below. “One of the most disturbing observations which deserves serious investigation concerns the considerable potential increase in risk of cancer after Gardasil vaccination for those who have been pre- exposed to the human papilloma virus. Prime example of how the public and DOCTORS are misled! Gardasil Vaccine Page brings you a letter published by NaturalNews on 2 March 2012. Mike Adams has printed a letter from SaneVax dated 22 February 2012 to the Editor of Journal of Internal Medicine. SaneVax are requesting that this important journal conduct more research and publish the results to rectify the misinformation published. Please click on the link and read their letter. Perhaps if you are a victim of Gardasil vaccine you might like to take the time and write to the Journal as well. Is Gardasil promoting the risk of getting other HPV infections? ” According to a recently published, industry-sponsored study conducted on 12,852 young women, HPV vaccination was found to reduce HPV-16 infections a mere 0.6% in vaccinated women versus unvaccinated women. At the same time, other high-risk (carcinogenic) HPV infections were diagnosed in vaccinated women 2.6% to 6.2% more frequently than in the unvaccinated women. The increased rate of infections caused by carcinogenic HPV types other than those targeted by Gardasil in vaccinated women is 4 to 10 times higher than the reduction in HPV 16/18 infections. Click on the link and read the full story. Medical Journal now questioning The science and ethics of HPV vaccinations! ” The Annals of Medicine published a ground-breaking peer-reviewed paper titled, Human papillomavirus (HPV) vaccine policy and evidence-based medicine: Are they at odds?, 1written by renowned researchers Lucija Tomljenovic, Ph.D., and Christopher Shaw, Ph.D., with the Neural Dynamics research Group, University of British Columbia, in Vancouver. 2. Is Gardasil Vaccine the culprit? On 12 January 2012 NaturalNews brings the story of at least 12 schoolgirls in New York developing debilitating mystery illness. What is more interesting is that the Health Department refuses to disclose the cause. NaturalNews asks as to please note that the suggested connection between the mystery illness and the HPV Gardasil Vaccine is unconfirmed and is merely speculation based on the other facts presented. Read the full article to know what is being said and what the speculation is based on. NaturalNews on 21 November 2011 brings information on a woman from Melbourne woman who experienced an auto immune and neurological attack after receiving Gardasil Vaccine. Apparently a group of seven other women are considering joining in with her class action. I, personally, hope they are all successful and that this will be enough to stop the Australian Government promoting this absurd vaccine! Is this what you want for your daughter? Do you now want to see it happen to your sons? These YouTubes come from a Dr Mercola Newsletter dated 29 November 2011 and if you have any doubt about the harm that this Gardasil vaccine causes then stop and take the time to listen to these heart rending stories! Then click the link and read what Dr Mercola has to say. On 23 December 2011 Prevent Disease brings news of a recent publication in the Annals of Medicine which is exposing the fraudulent nature of Human Papilloma Virus (HPV) vaccines such as Gardasil and Cervarix. The researchers key information include a lack evidence for any HPV vaccines in preventing cervical cancer and more importantly lack of evaluation of health risks! I believe that this Gardasil Vaccine page is a testimony to the last statement when you read all the stories of harm that have occurred! On 19 December 2011 NaturalNews brings more alarming news on the HPV or Gardasil Vaccine. Janny Stokvis from SANE Vax Inc. is an analyst at VAERS and has reported four new HPV vaccines deaths (3 Gardasil and one unknown manufacturer). Read the article and learn more and please protect your kids from these harmful vaccines! “Medical consumers worldwide applaud the recent FDA decision not to expand the use of Gardasil to women over the age of 26. Now they want to know when the FDA will admit the original approval may have been a mistake. NaturalNews brings us information on 12 February 2011 with regard to the incidents of abortion and stillbirth events from HPV4 vaccine Gardasil supersedes the same event from all other vaccinations. Read the article. Gardasil Vaccine Page brings more information from NaturalNews dated 10 February 2011. “Ryan Richardson and brother, David, announce the debut of a special preview of their new documentary, One More Girl. Gardasil Vaccine: On 25 January 2011 Natural News bring an article on the face of increasing reports of adverse advents and death rates that are 400% four hundred percent! higher than other vaccines.